Autoweek ran an article today titled "Audi TT RS: We say, 'Bring it!'" At first glance, I thought this was either a European road test, or some kind of new "RS for America" rumor. In fact, it was mixture of both. A European car, driven in America, with a battle cry sure to spawn new speculation and subsequent anticipation, of another RennSport Audi destined for US shores. In brief, we'll second Autoweek's motion and say "Yeah Audi, Bring it!" 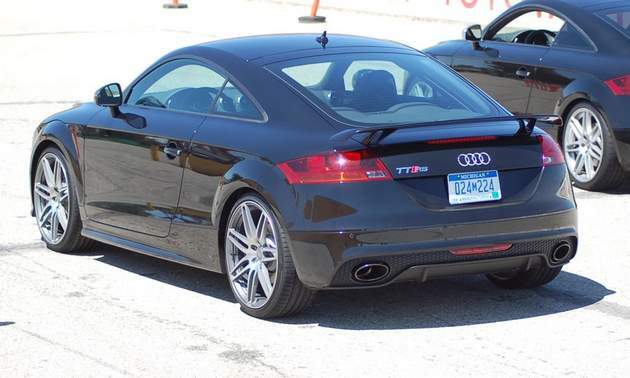 So how did Autoweek get to drive a "not for North America" Audi TT RS on US soil? Well, in a very unorthodox fashion, Audi is testing the waters by shipping over a TT RS and letting Autoweek and other auto journalists drive the car. These tests and "expert" opinions will hopefully help Audi of America convince Audi AG that bringing the TT RS to America is good idea. In addition to the US Audi TT RS' Autoweek testing at Willow Springs, Fourtitude has secured the car for the upcoming Carlisle Import Show next month in Pennsylvania. We'll be at the Carlisle show and can't wait to see the car in person. So, if you're in the central PA area, mark your calendars for May 21-23rd and attend the show, it should be an awesome event. For more info on the Carlisle Import GTG, click here.